Saxophone Santa visits Daughters of Charity in Albany! Mary Clinton, Lady of Charity in Albany, NY, organizes a monthly gathering, “Saturday with the Sisters”, for the Daughters of Charity living in Albany at the St. Louise House. She invites the Ladies of Charity and the Junior Ladies to share in the events. 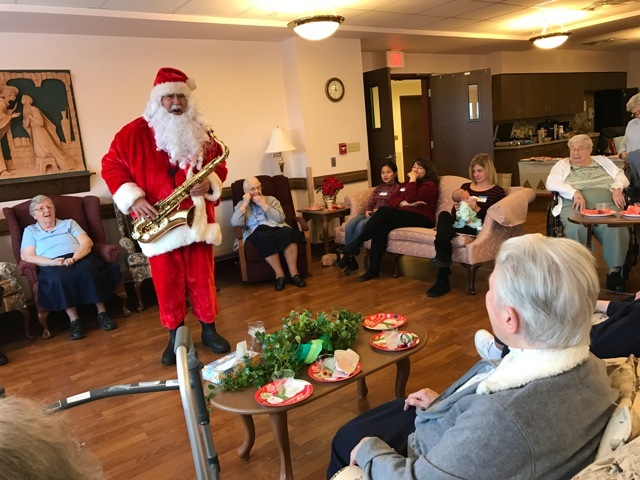 The Ladies always have a lot of fun and enjoy meeting newly arrived sisters and learning about their remarkable histories, but Sat., Dec. 16 was especially fun with the arrival of Saxophone Santa who delighted EVERYONE! It was a lovely afternoon in the decorated space with terrific cookies baked by the Ladies. A highlight was a mother of one of the Junior Ladies who brought a newly born foster child that the family is temporarily caring for. The sisters so enjoyed watching the baby along with Santa! A terrific event!